Emillie Marvel is a programming assistant at idobi Radio. Outside of work, you’ll catch her trying to live like ‘Friends’… or at the very least, find her own Central Perk. The guys are back for one more time in 2016, and it might be their best episode yet. 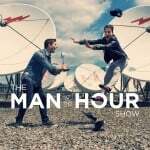 Another week has gone by, and that means another episode of Man Of The Hour is ready for your ears. This Thanksgiving, bring your earbuds to the dinner table, so you can turn up the volume and enjoy eating until you can’t anymore (and then some) with Man Of The Hour. Grab your best headphones, and settle in, because it’s time for another episode of Man Of The Hour. Welcome back to Man Of The Hour, where the conversations only get weirder and the music only gets better. This week, the guys celebrate Nelly’s birthday and frequent flier card status upgrades—it’s an exciting time, that leads to plenty of conversation topics and informational tips!